MONTREAL - Montreal Canadiens Executive vice president and general manager, Marc Bergevin, announced Friday the appointment of Gerard Gallant as assistant coach. A native of Summerside, P.E.I, Gerard Gallant was selected in the 6th round, 107th overall, by the Detroit Red Wings in the 1981 NHL Entry Draft. He would go on to play 11 seasons in the NHL, nine as a Red Wing from 1984 to 1993 and two more with the Tampa Bay Lightning from 1993 to 1995. Born on September 2, 1963, Gallant played 615 NHL games, scoring 211 goals and 480 points, and served 1,674 penalty minutes. He also took part in 58 playoff games recording 18 goals and 21 helpers along with 178 penalty minutes. Gallant enjoyed 70-point seasons on four occasions, including his most successful year in 1988-89 when he tallied 39 goals and 54 assists for a career high 93 points and 230 penalty minutes. In 1994-95, he also had short stints in the International Hockey League (IHL) with the Atlanta Knights and the Detroit Vipers. 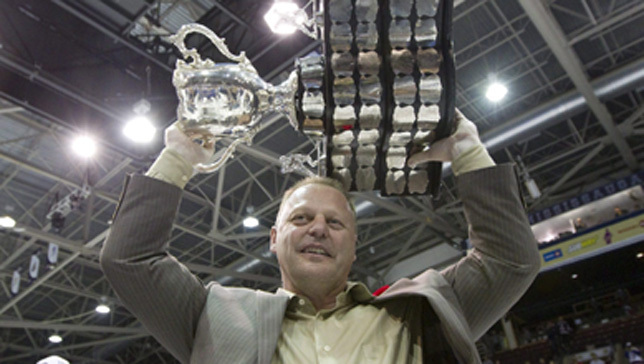 Now 48, Gerard Gallant began his coaching career in 1995-96 with the Summerside Capitals of the Maritime Junior Hockey League (MJrHL) leading the team to the Royal Bank Cup in 1997. He would step down in 1998 to become an assistant coach with the Fort Wayne Komets in the IHL and on to the AHL Louisville Panthers in 1999-00. On July 18, 2000 he was hired as assistant coach with the new Columbus Blue Jackets franchise. He would be named head coach of the Jackets on June 2004 and lead the team until November 13, 2006. The following season, Gallant joined the New York Islanders organization as an assistant to Ted Nolan in 2007-08 and to Scott Gordon in 2008-09. On April 24, 2009, Gallant was introduced as the new head coach of the Saint John Sea Dogs in the QMJHL. In his first season behind the Sea Dogs’ bench, he led his team to a franchise record 53 wins and 309 goals scored and earning the regular season title. He was named the QMJHL as well as the CHL Coach of the Year while taking the Sea Dogs to the President’s Cup final. Gallant’s second season, in 2010-11, was even more successful as his team tied a QMJHL record with 58 wins and repeated as the QMJHL and CHL Coach of the Year. The Sea Dogs won a second straight regular season championship and a President’s Cup before capturing the Memorial Cup becoming the first Atlantic Canadian team to win the trophy. In 2011-12, Gallant and his Sea Dogs earned yet another QMJHL title with a league-leading 50 wins, 15 losses and 3 shootout wins and a second consecutive trip to the Memorial Cup. Over three seasons at the helm of the Saint John Sea Dogs, Gallant’s record sits at an amazing 159 wins, 34 losses and 9 overtime/shootout losses. Furthermore, the Sea Dogs set a QMHJL record as they became the first team ever to have three consecutive 100-point seasons. Gerard Gallant and his wife Pam, are the parents of two children.